In one of the bereavement groups I go to, a mom, who is coming up to the 1 year anniversary of her daughter’s death was saying, that she had been feeling really bad recently. It was about a year ago that they found out they could not longer treat her daughter, and that she would die. Some of the other moms said the same thing happens to them – even 11 years later. I know that every year, around the anniversary of my dad’s death, I get very sad too – it has been 9 years since he has been gone. Often, I am not even THINKING about it, I just get very sad. I am sure that will happen for many years to come, if not forever with me. This time a year ago, we were going through Alexander’s Bone Marrow Transplant. While, he did very well, he did have some very rough days. They give chemo to kill off EVERYTHING, and the kids can get very sick. Alexander, who already had blood pressure problems from his tumor, had even MORE problems, that landed him in the ICU for a few days. 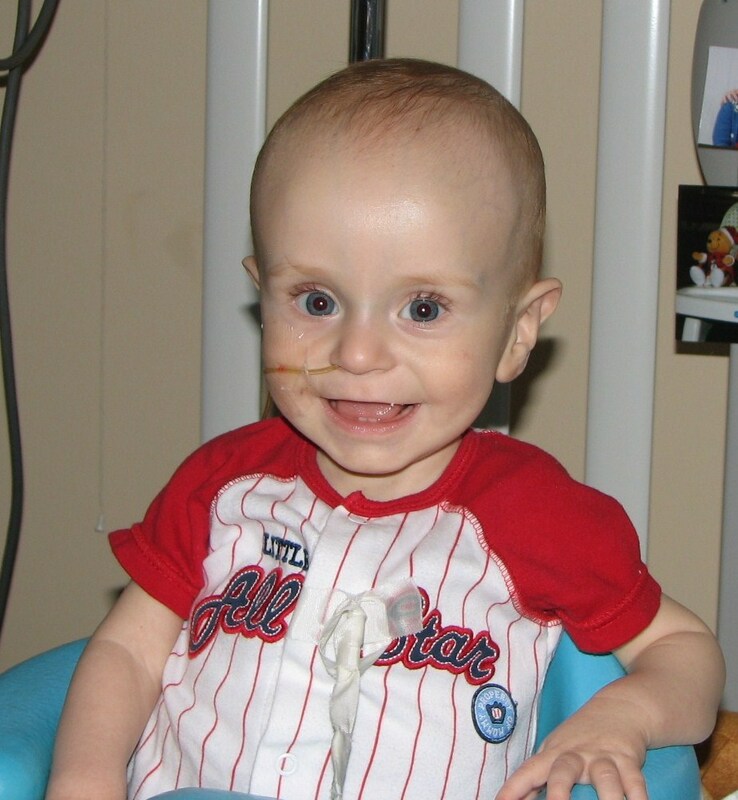 On Friday, January 20th, another young boy, Cole, lost his fight to neuroblastoma. Although, I kind of like how his dad worded it – the cancer did not KILL him – he died to KILL the cancer! The days around his death, waiting for the wake and funeral were hard for me. I was of course very sad for them, but I was also remembering what we went through during those days. I knew how hard it would be for them to have to make the decisions that no parent should ever have to make! I did a lot of praying during those days – prayers for the family, for the strength they would need to make it through. Growing up we didn’t have pets. Well, I had fish, and my sister had a hamster for a little while, but that was it. Before I got married, I got a cat. I love my cat, and Alexander loved him too. But, I had never really understood how people could be so attached to their pets, I mean, after all it is just an animal. But, recently we had to take Max to the vet for a checkup. He needs a tooth pulled, and they tried to pull it at the office. He CRIED! I almost started crying right then and there! I think that it brought back too many memories of the painful things Alexander had to go through. We had to take him for a Cardiac Echo – again, memories are flooding back into my mind! In two weeks he needs to go under anesthesia, I am wondering how I will handle that, or if I will just have to send Richard off by himself! I am by no means comparing what Alexander went through with that of a cat. However, it is the feelings of helplessness that are coming back into play. We went through a very traumatic year with Alexander, and just when I think I am doing “better” something like this comes up, and I realize I am still a MESS! I know it hasn’t even been a year yet, but I can have such good days, and other days, well…..they just aren’t so good. I know there is no time limit on healing – it is just I was going forward pretty well, and now I feel like I am 10 steps back. Back on my sofa, not wanting to DO anything, eat anything, talk to anyone! But, I also know that isn’t good. I do take my days to myself, and I am kind to myself and do only what I can handle. But I also know that I may suffer from the PTSD for the rest of my life. I mean, really, how DOES one get over the lose of a child??? How do you define rare? Prior to March 8, 2010, I never knew anyone that had a child with cancer. I had “heard” of childhood cancer, read books about kids with cancer, watched tv shows. I cried over the St. Jude’s commercials, and every year went to the “Scooper Bowl” to support the Jimmy Fund. But, other than that, I never really gave much thought about childhood cancer. Until that one horrible day in March, when the doctors said “I am sorry, but we found a mass in Alexander’s abdomen”. Needless to say this has caused a LOT of anger among the many parents that have children suffering from some form of childhood cancer. While, yes, if you count all cancers as a whole, I suppose you could say that childhood cancer is “rare”. But to the 46 kids a day that find out they HAVE cancer, and the 7 kids that will die EVERYDAY, “rare” means NOTHING! Hmmm….rare but yet “most common” – how do those words even go together? What can be done about all? Well, some years back, it seems to me that breast cancer was such a “taboo” subject one that people didn’t talk about. Now, however, it seems as if there are pink things everywhere! A whole month is dedicated to it, 2 day walks, etc. Now, I am not proposing to turn everything in creation GOLD (I mean really, does a PINK Mixer, really do anything for breast cancer?) But, perhaps, if there was more done to raise AWARNESS for Childhood cancer, then more FUNDS would be put out there to help raise money for research. The more research, the more chances of finding treatments, and giving these kids a chance to grow up! Nearly 70% of those children first diagnosed with neuroblastoma have disease that has already metastasized or spread to other parts of the body. When disease has spread at diagnosis and a child is over the age of 2, there is less than a 30% chance of survival. The National Cancer Institute’s (NCI) federal budget was $4.6 billion. Of that, breast cancer received 12%, prostate cancer received 7%, and all 12 major groups of pediatric cancers combined received less than 3%. The American Cancer spends less than 70 cents of each 100 dollars raised on childhood cancer. Every family is potentially at risk. In almost all cases, childhood cancers arise from non-inherited mutations (or changes) in the genes of growing cells. As these errors occur randomly and unpredictably, there is currently no effective way to predict or prevent them. Most adult cancers result from lifestyle factors such as smoking, diet, occupational hazards and exposure to other cancer causing agents. Nationally, childhood cancer is 20x more prevalent than pediatric AIDS. Pediatric AIDS receives 4x the funding that childhood cancer receives. In one month there are 2x as many deaths from childhood cancer as pediatric AIDS for the entire year. In the past, I had always been a big believer in the “Power of Prayer”. One of the best examples I have of prayer working in my life, was back when I was living in Virginia. I was a full time volunteer with Habitat for Humanity. I had a place to live for free, however it was about 30 minutes from work and 45 minutes from the church I was going to so I wanted to find some place closer. One Sunday at Church, they were doing a baby dedication. It was a non-denomination church, so they did not do baby baptisms. The baby girl was 7 months old, and had 20 month old twin brothers. Dad was going over seas for 6 months with the Navy leaving mom alone. I decided to pray for that family, and asked God to send someone to help her. A couple of weeks later, I had gone to a potential house for me to live in. However, she could not let me live there for free, and I could not afford the rent. She said she would “pray for me” – I wasn’t holding up much hope. However a few days later I got a phone call from a woman who had gotten my name from the woman I had visited. She invited me to come to her house and see if it would work for us to live together. Wouldn’t you know, it was the woman I had prayed for a couple weeks before in church! God had sent ME to be the one to help her! I lived with that family for about 9 months. I got free rent in exchange for helping out with the children when I was not working. The 20 month old twins started College this year, and the 7 month old girl is in high school with her eyes set on being a Veterinarian when she heads off to college. Another baby came about a year after I left! So, I have seen prayer work in wonderful ways. But when Alexander got sick – things changed for me. We had many people praying for him, praying that he would be cured. But, those prayers were not answered. I have heard it said that God answers all prayers, but sometimes the answer is “NO”. I don’t know why our Alexander was not healed from his horrible illness, but others have been. Cancer is a horrible disease – and some people respond to treatment and others do not. But, I do NOT believe that God is up there going “yes, for this one, no for this one – well, maybe sort of for now, but I am going to send the cancer back in a few years”. So – how do we pray for people in times of great illness? I have thought about those that need say a heart transplant. Sure, you want to pray that a heart will be “found”, but the only way for a heart to be found is for someone ELSE to die! How do you pray for that? Not an easy prayer by any means. Many people wondered how we “did it” – kept our energy and strength going while Alexander was so sick. I like to think it was the people praying for us. It was their prayers, for our day to day lives that kept us going. Each day was such a challenge for us. Even on the “good” days we were always waiting for the next thing to happen – wondering not IF but WHEN we would have to go back to the hospital again. When I pray now for those that are still fighting the battle against STUPID CANCER – I pray for peace and strength. Each day is a challenge – every choice is a challenge. Do we consent to this test? Do we ask for a second opinion? Is that opinion right? Do we have the surgery? Do we not have the surgery? Do we turn off the machines and let them go? None of the choices families with a sick loved one are easy – and no matter what the choice, you always wonder if you made the right choice or not. So – go out PRAY – pray for those in need – pray for those that don’t have anyone to pray for them. Pray for PEACE and STRENGTH for all those that are fighting. I found myself missing Alexander in a different way tonight. I miss him ALL the time, but tonight it was a bit different. Richard and I were at a Bruins game, and there was a dad carrying his little boy – that was maybe the same age as Alexander. It made me sad to think about all the things we never got to do with Alexander. Don’t get me wrong, I am not one for taking 2 year old’s to Disney or big events that they will never remember! BUt I was just thinking about all the things we WOULD have done with him as he grew up. He will never go to Story Land or Santa’s Village (those in the MA/NH area know what I am talking about) He will never ride the Polar Express. We won’t ever take him to see an Ice Show, Circus, or Game at the Garden and have him begging us for the overpriced treats which we would have surely bought him. This week our friends posted about how they were able to take their son Cole out of the hospital for a few hours, and just BE – they got to go on the Ice Skating Rink at Frog Pond with him in his wheel chair. Cole may not have long for this world (he too has stupid cancer – neuroblastoma like Alexander)- those precious few hours meant more to that family, than just about anything I can think of right now. As I talked about in my last post, all to often we are caught up in the busyness of life, and forget about the small little things. This poem below came up on Facebook this week. I don’t know who wrote it I think it says a lot about just taking the time to BE and enjoy. You don’t have to spoil your kids rotten and give them everything they want, just love them and hug them, and give them an extra cookie once in a while just because!